The purpose of the early childhood community liaison is to build a partnership with families, early childhood providers, and the school district to ensure the children's readiness skills for entering kindergarten. If your child turns five by September 15, 2019, register for kindergarten at the Curriculum office, located in the central office at 919 Cody Ave., Monday through Thursday from 8:00 a.m. to 4:00 p.m. or Friday from 8:00 a.m. to noon. Please bring your child’s birth certificate. Wyoming immunization records are available electronically; please bring immunization records from other states or countries. Please note that if you do not have your child’s birth certificate or out-of-state immunization records, register anyway! You can provide the documents at a later date. We invite all incoming kindergarten students to attend camp June 10 through June 27, Monday through Thursday, from 8:00 a.m. to noon at Sunset Elementary. You can sign up for camp when registering for kindergarten. The kindergarten readiness camp is an excellent opportunity for children to transition from preschool or home to kindergarten in the fall. This program is being provided free to any child registering for kindergarten for the 2019–2020 school year. Join the fun for Preschool Friday! Open: 8:10 a.m. to 12:00 p.m. Arrive any time after 8:10 a.m., and stay for as long as you would like. 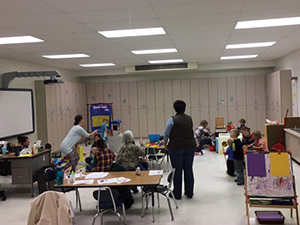 It is a preschool classroom open to all families in Park County School District 6. There are no structured activities during this time. It's just a classroom for children to play! There's a kitchen area, car table, art center, sensory table, puzzles, blocks, games, and more. This event is free! Please note that parents/guardians must stay with their child(ren) while attending Preschool Friday.